Superb hospitality, mouth-watering food, a deeply rich cultural history and jaw-dropping scenery, Turkey, the bridge from East to West has so much to offer. Away from the resorts of the South coast, this is a culturally rich destination that you can't help falling in love with. 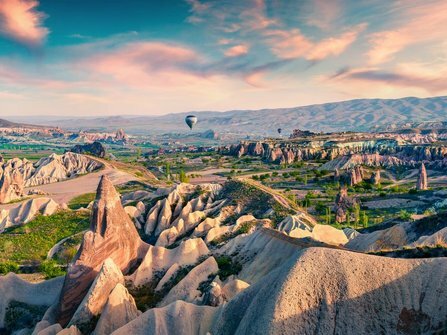 We are very proud of our Turkey collection, which includes sea kayaking and wild camping on the beaches of deserted islands, seeing the highlights of Istanbul, the incredible ancient city of Ephesus and trekking in the semi-lunar landscape of Cappadocia. We have carefully hand-picked a selection of boutique hotels which will help to make your stay that bit more memorable. Please have a look at the itineraries on offer and don't hesitate to get in touch if you would like to personalise any of them. An activity holiday for families with a sense of adventure. 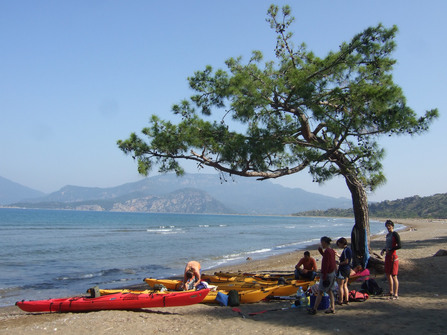 Snorkel, kayak and go canyoning in picturesque south west Turkey. A perfect half term holiday for families interested in culture and ancient history exploring Istanbul & Ephesus. Combine three nights in Istanbul with our family activity holiday in picturesque south west Turkey. See the best that Cappadocia has to offer with our hand-picked selection of guided treks, based in an atmospheric cave hotel. A family holiday staying in hand-picked boutique accommodation & a perfect balance of culture & the great outdoors. Service rating : Jayne was very quick to respond to our initial enquiries. Once we had booked, she was also extremely helpful with a few hiccups we had - we had difficulties with the online check-in for our outbound flights, which she resolved for us. Then our outbound flight (on a Saturday, outside the company's office hours) was hugely delayed, and the details for our Istanbul hotel stated that they didn't have 24 hour reception, so Jayne contacted them to let them know we were arriving late and rearranged the airport transfer. The whole trip was well organised and ran very smoothly. Product : Hotels extremely well chosen and located for families - we were travelling with our 12 year old son and 8 year old daughter. The Istanbul hotel was a few minutes walk from the Blue Mosque, and the Cappadocia cave hotel was just stunning. The guide and driver in Cappadocia were excellent and went out of their way to make our time in their region as enjoyable as possible. And the sights and scenery were just breathtaking. My son, around whom the holiday was designed, gave it 9/10. Not sure where the point was lost! The holiday was amazing. We loved every minute of it. All three guides, one on each trip were excellent, coped with the variety of people on the trips well - especially so on the Canyoning - were knowledgable, competent and friedndly. Only slight disappointment was the snorkleing trip which was enjoyable but there wasn't a lot pointed out to look at; so kayaking and canyoning 5, snorkelling 4. The Riverside hotel - great, couldn't fault it for the price range. Staff really friendly and helpful, rooms basic but good, pool excellent. A really enjoyable trip, I would recommend it to others.